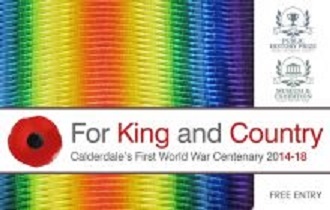 An Open Day based upon the King and Country exhibition will be held on Saturday 9 June at Bankfield Museum. There will be free activities and events suitable for all ages commemorating the region’s First World War experiences. Bankfield Museum’s exhibition commemorating the region’s wartime contribution features over 200 objects, 200 images and archives and 60 local stories to explore local experiences during the First World War. From soldiers, sailors and nurses to those at home working in munitions, hospitals and fundraising. The exhibition was winner of the Public History Prize by the Royal Historical Society. An article by Angela Clare, who was Project Officer and is now Collections Manager for Calderdale Museums, about creating the exhibition and winning the Public History Prize is online HERE. The exhibition has also featured temporary exhibitions during the centenary years. In 2015 we hosted ‘Hats off to our Heroes’ by Vendredi Millinery Group. 2016 saw a loan of the touring exhibition ‘Calm During the Storm’ by the National Embroiderers’ Guild. We also focussed on the anniversary of the Somme and the Halifax Great War Heritage Association also researched and created an exhibition on the impact of the Somme on the region. For 2017 the Royal Armouries in Leeds loaned a new touring exhibition on Sir Arthur Conan Doyle’s First World War inventions. In 2018 our focus will be on remembrance and the legacies of the war.